Can Reducing the Number of Violations Reduce the Number of Fatalities? In this edition of Cintar Connection we start Part One in a three-part Safety Series. Inspired by feedback and the Top 10 Most-Cited Standards List, these next three issues will focus on worker safety. 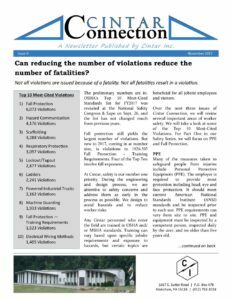 In this issue we look at PPE, Fall Protection, and Fall Protection – Training Requirements. Are there any topics you would like to read more about? Do you have questions about what you have read? Would you like to contribute? Let this newsletter serve as opening the doors for communicating your needs with us and our knowledge with you.